The compact URSA Mini camera with EF lens mount, 4K Super-35 image sensor and global shutter is lightweight and perfectly balanced for handheld use and comfortable enough for all day shooting. URSA Mini 4K EF features professional 12G-SDI connections, 5” fold out touchscreen monitor and side grip with camera control functions as well as dual CFast card recorders, built in stereo microphones and more. The Blackmagic Design URSA Mini 4K EF is the worlds lightest, handheld super-35 digital film camera. Why digital film? Because the new sensor gives you 15 stops of dynamic range that rivals the good old days of film, for amazing cinematic 4k images. And now the this technology has never been more accessible and affordable! The EF mount version of this camera would be the perfect choice for promotional films, commercials and music videos, giving you access to your existing Canon lenses or access to a wide range of third party EF mount lenses. Whether you are making indie films, television programs, commercials or music videos, the Blackmagic URSA Mini is the most convenient way to get you productions made without technology stepping in your way. Designed from the ground up as an ergonomic, lightweight production solution, The URSA Mini is perfect for smaller crews Or even single person shooting, and can be attached to rails, matte boxes and any other peripheral accessory as well as equipping it with its own custom shoulder mount. 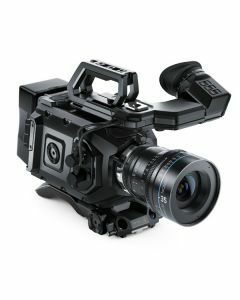 The URSA Mini is the perfect professional cinema camera for small crew productions. Frame Rates: Maximum sensor frame rate dependent on resolution and codec selected.Project frame rates of 23.98, 24, 25, 29.97, 30, 50, 59.94 and 60 fps supported.